I used to hate sweet potatoes. I swear, I feel like half of my blog posts are me telling you how I used to hate a specific food (brussel sprouts, coconut, cauliflower etc.) and now I love it. I used to think they were way too sweet and mushy. Like baby food. Blegh. Then….I met my husband. 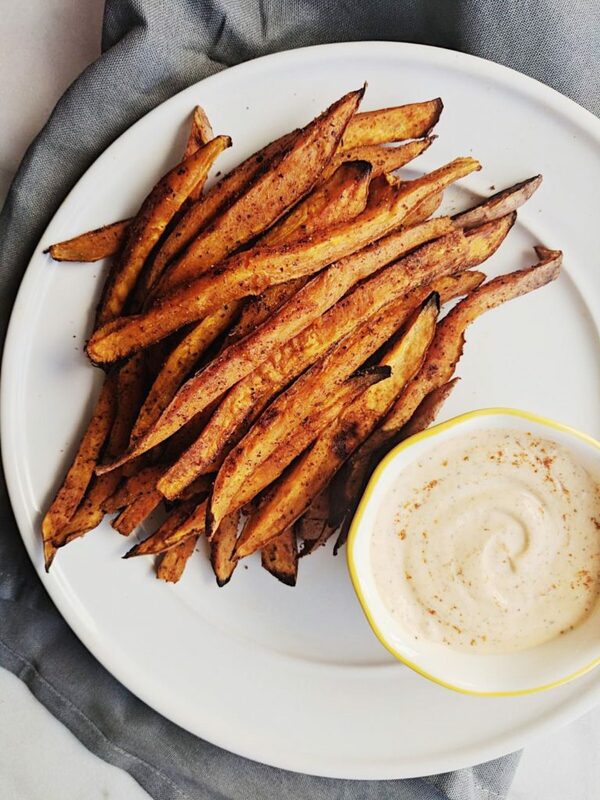 And learned the joy of baking your own sweet potatoes and turning them into FRIES. And said fries don’t turn out mushy OR too sweet. In fact, they’re crunchy and deliciously flavorful. Is there a person on this Earth who doesn’t like fries? If so, I feel so sorry for those poor souls. Anyway, if you didn’t already know, sweet potatoes are SUPER good for you. Packed with nutrients, lots of beta carotene/vitamin A (good for healthy skin and eye health), vitamin C and dietary fiber! And with this recipe, you get to dip them in the most amazing aioli. Which we all know is just a fancy term for mayonnaise, right? K, just checking. Aioli sounds cooler anyway. Make super easy homemade cajun seasoning filled with spices you probs already have in your pantry. Coat the taters with said seasoning. Mix mayo a la other things in a bowl. Easy enough for a Friday, right? You made it to the end of the week, my friend! Proud of you. Cheers to alllll the fries and the weekend!! 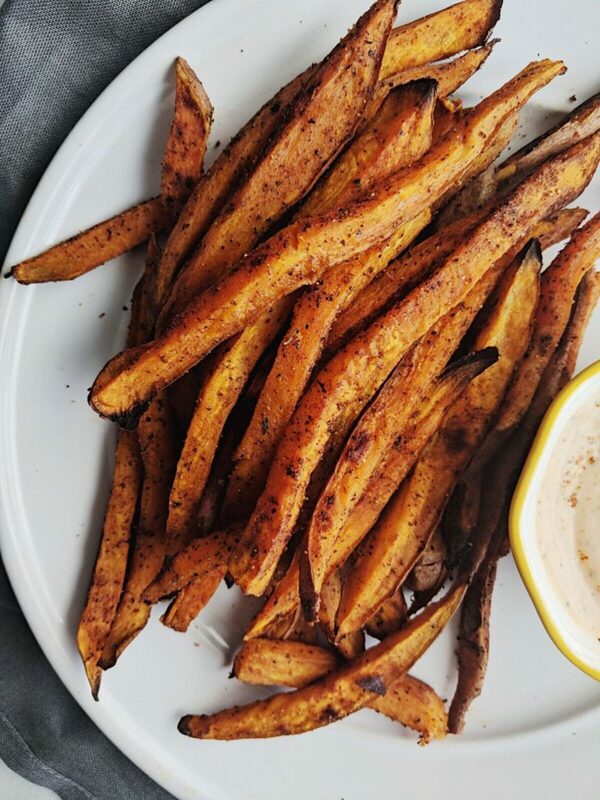 A homemade cajun seasoning on crispy sweet potato fries! Preheat oven to 400 degrees. Cut sweet potatoes into long, thin strips. Place them on a baking sheet. Drizzle 1 tbsp of olive oil on the potatoes. 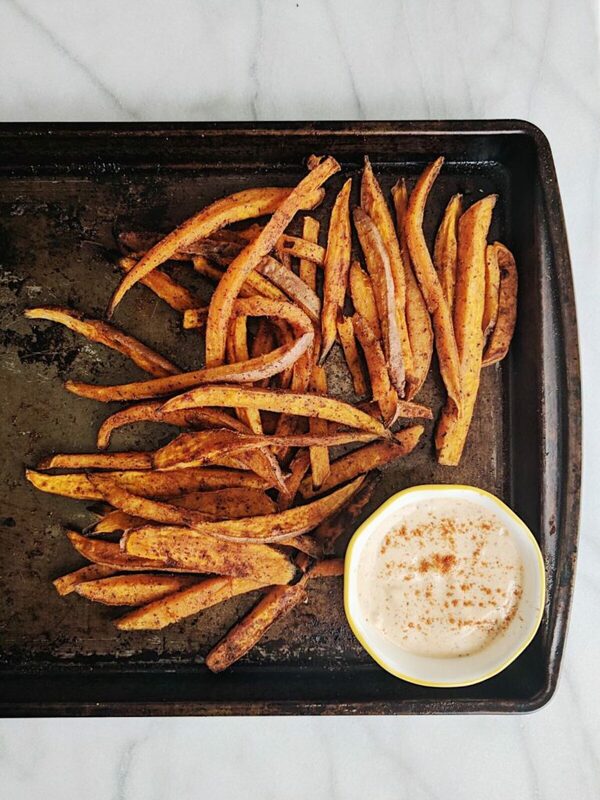 Toss the sweet potatoes using your hands until they're fully coated with the oil. Drizzle additional olive oil (up to 1 tbsp) on top for added crispiness. Mix all of the spices together listed above to make your cajun seasoning. Using a spoon, slowly spoon half of the seasoning onto the potatoes. Using your hands, toss the potatoes until the seasoning completely covers them. Sprinkle the second half of the seasoning on top of the potatoes, making sure each little guy is completely covered! Mix mayo, spices, hot sauce and the juice of half a lemon together. Add additional hot sauce if you desire. Bake for 40 minutes, flipping halfway through. Once the 40 minutes is up, broil the potatoes on hight for 1-2 minutes - keeping a close eye on them! 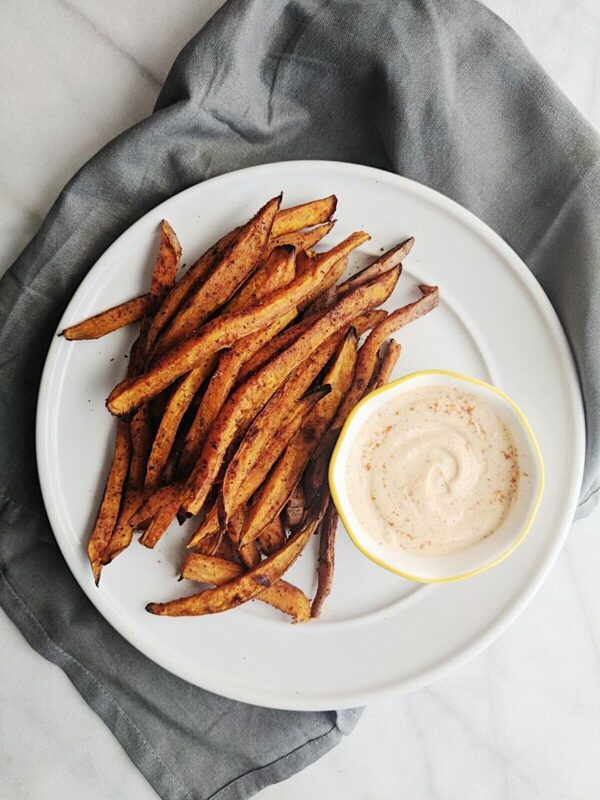 Serve hot and dip in lots of spicy aioli! 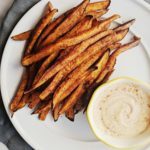 Sweet potato fries are one of my favourites! These look delicious and the dip sounds like a nice change to ketchup that i usually use!